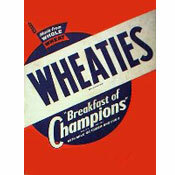 This was an O-shaped cereal that was similar in shape, and some some flavor, to Honey Nut Cheerios. Like all the cereals produced by Manischewitz, this product was "Kosher For Passover." The cereal box featured the character Magic Max. 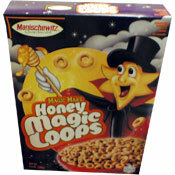 For more about this skinny character with the star-shaped head, check out the cereal Magic Max's Cocoa Magic Crunch. 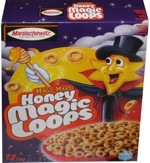 What do you think of Magic Max's Honey Magic Loops?